The first-ever collection of interviews with the tortured but groundbreaking singer Billie Holiday, part of Melville House's beloved Last Interview series Legendary singer Billie Holiday comes alive in this first-ever collection of interviews from throughout her career, including her last, as well as the transcript of an interrogation by US Customs officers, part of a harasment campaign waged against the singer by law enforcement officials. 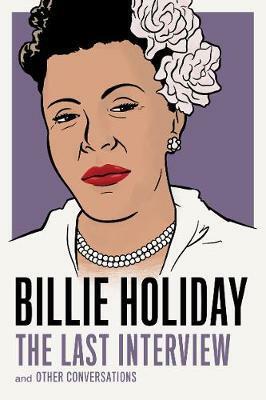 Drawn from music magazines, late-night radio programs, and newspapers from across the United States and Canada, in these conversations Holiday discusses her childhood, the musicians who influenced her, her friendship--and falling out--with the influential saxophone player Lester Young, her chosen symbol (the gardenia), why she quit Count Basie's band, her substance abuse problems, song-writing and memoir-writing, and more. In frank and open conversations, Billie Holiday proves herself far more articulate, aware, intelligent, and even heroic than the way she's often portrayed. This collection is an essential volume for all who have been moved by her music. Billie Holiday (b. 1915; d. 1959) was perhaps the greatest singer in twentieth century jazz. Her heartfelt phrasing and improvisational skills had a seminal influence on the form. She emerged from a troubled childhood to quick popularity in Harlem nightclubs, followed by commercial recording success. However, after drug problems landed her in prison in 1948, she lost her cabaret license, which meant she couldn't perform in the jazz capital, New York City. This blow compounded problems with her finances, her health, her reputation, and, devastatingly, her voice. Despite a few triumphant comeback performances at Carnegie Hall and some mildly successful recordings, she never fully recovered her standing, and she died of cirrhosis of the liver in 1959 in a New York hospital--with police stationed at her door to arrest her on another drug bust should she recover. Holiday was the recipient of four Grammy awards--all of them posthumous. Khanya Mtshali [introduction] is a writer and journalist from Johannesburg, South Africa. She writes about fashion, history, politics, race, gender, and books. Her work has been featured in The Guardian, The Outline, Timeline, Bookforum, The Rumpus, Quartz, Glamour, and The Daily Maverick.